In 1955, 33 keen vine-growers coming from Montecchio Maggiore and the neighbouring towns founded the "Cantina Sociale dei Colli Vicentini", in the heart of Veneto renowned for its ancient qualified vine-growing tradition. Since then the cellar has made great progress, constantly engaged in the improvement of the quality of its products by adapting the most up to date technologies and by conforming to the different market demands. 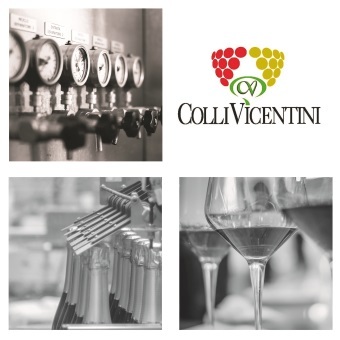 The commitment undertaken by Colli Vicentini is to concentrate on the quality of the wines by safeguarding the characteristics of vines and by maintaining local traditions. Thanks to the work of its oenologists and agronomists, the cellar guarantees the entire process "from vineyard to sales" through the continual monitoring of the production, the diversified manufacturing of the grapes and the control of the vineyards in order to produce quality wines. Veneto, where viticulture has been flourishing and improving for centuries, is the Italian region which produces the greatest quantity of DOC wines. The particular soil structure of these areas, which are beaten by cold winds coming from the north but also protected by high mountain ranges, together with its favourable setting in the sun create the optimal climate for vine-growing. The co-operative produces the excellent Colli Vincentini range together with the premium "Torre dei Vescovi" range, a collection coming from the best selected grapes in order to satifsfy the most demanding and fine palates. Romeo Prosecco and Juliet Rose spumante have proved to be a great addition to the wineries labels.